Hi Guys, All we know very well most of the person spend his lot of time either on TV or Smartphone. Most of the person specially kids spend his lot of time on these electronic gadgets. Due to which the eyes capacity will be down. We try to taught our kids and other person “don’t sit too much near of the TV”, who like to spend his lot of time in front of these electronic gadgets. Most of the person want to know how to take care of our eyes during using the smartphones. So, today we have to discuss few important tips to protect your eyes when using the smartphone. Your eyes will be infected with different problems if you spend your most of the time in front of smartphones or TV. Most of the Doctors advise us don’t spend your lot of time for using an electronic gadget. They suggest different eye-drops to recover your eyes dryness apart of that take precaution of your eyes. All we know eyes are an important part of our body. So, it’s our duty to take care of our eyes. Most of the person spend his vacant or boring time for chatting, watching movies, surfing on internet and many more. Smartphone screen size is small then TV so they put his smartphone very close to his eyes. This is the wrong way, if you put your phone very close to your eyes, then you must have to face eyes problem. So, always remember you just keep the smartphone up to 15-20″ distance from your eyes. This is an important tips to protect your eyes when using the smartphone. Most of the person don’t blink his eyes during playing the games or watching an interesting movies or video on his smartphone. Due to which your have to face reddishness or dryness problem in your eyes. If you want to keep safe your eyes then you must have to blink your eyes regularly. Normally a person 2-50 blinks per minute depending on the condition. Blink your eyes keep the eyeball clean and moist. 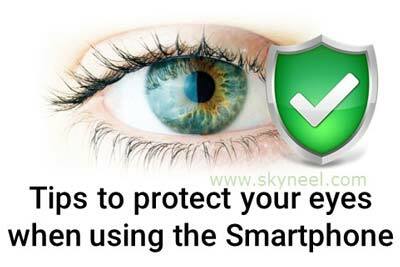 It is an important tips to protect your eyes when using the smartphone. Most of the person increase the brightness of his smartphone. Lot of brightness is harmful to our eyes. Sometime we need to increase the brightness of your smartphone screen in low vision or full sunlight place. If you increase the brightness of your smartphone then will effects on your eyes too much. Lot of time you have to feel the problem to watching the smartphone screen. So, always remember you must have to set the level of your smartphone brightness as per your need. If you protect your eyes, then we must recommended to set the brightness level accurate on your all electronic gadgets. Lot of person think why we wash our face during spending the time on smartphone or other electronic gadgets? When you continuously use your smartphone or watching any electronic gadgets then you eyes will be tired. After some time you feel pain in your eyes. It’s a better idea to reduce the dryness of your eyes to waste your face. When your eyes touch the water you feel too much relax and your eyes will be safe. At present time most of the smartphone comes with anti-glare coating or special corning glass protection. But if you don’t have these protection then you must take your smartphone on mobile store and put it anti-glare coating or corning glass protection. It helps you to reduce the screen glare. You can also use anti-glare lens or glasses to protect your eyes during using the smartphone or any electronic gadgets. It’s an effective and quite impressive way to take a regular break during using the smartphone. If you close your eyes for few minutes during taking the break, it will fell great relax on your eyes. It’s an important tips to protect your eyes when using the smartphone or any electronic gadgets. It is an important tips to protect your eyes when using the smartphone. You just close your eyes and put your finger of both hand on your close eyes and move them in round shape with soft hand. It gives you great relaxation to your eyes. I hope you like this article. After reading this article you will be able to know important tips to protect your eyes when using the smartphone. Eyes is an important part of our body, so protect your eyes and share this article with your friends, family members and others. If you have any important suggestions then write us in the comment box. Thanks to all. Are you asking about Screen brightness? Set your phone brightness on auto by the system setting. if you will not find auto brightness setting then use auto brightness app from Google play store.